The Epson Expression Home XP-430 Small-in-One printer is a compact printer, ideal for students and home offices that print documents and graphics. It features printing, copying, and scanning capabilities with print speeds of up to 9 pages per minute. For more information on this device, check out this Epson XP-430 review from PC Magazine. The Epson XP-430 ink cartridges, Epson 288 ink, comes in standard or high yield sizes in all four colors: black, cyan, magenta, and yellow. A single cartridge of Epson XP-430 ink can yield as many as 450 pages at 5760 x 1440 resolution. If you're looking for an Epson XP-430 ink cartridge replacement of professionally-engineered Epson 288 ink, we've got you covered with singles of each color in standard and high yield option. If you print regularly and find yourself replacing your Epson 288XL ink cartridges often, we recommend our affordable and convenient combo packs in sets of 4, 5, 6, and 10 to suit any business size. Click on this Epson Expression XP-430 Guides and FAQs to find helpful troubleshooting guides written by our printer experts to resolve common issues like Epson XP-430 black ink not printing, the Epson XP-430 printing blank pages, and more. Need help with Epson XP-430 ink cartridge replacement? We've got you covered! If you see a message prompting you to replace your ink cartridge, press the OK button, followed by the Replace Now option on the LCD screen of your printer. If you are replacing your ink cartridge before the empty printer prompt, press the home button and select Setup on the LCD screen. Next, select Maintenance, Ink Cartridge Replacement, and lastly press the OK button on your printer. Squeeze the tab on the cartridge releasing it from its slot. Lift to remove the empty ink cartridge. Discard the cartridge. Gently shake the new cartridge about 3-4 times before opening the package. Remove the ink cartridge from its packaging. Locate the yellow tape located on the side of the cartridge and remove it. Insert the replacement ink cartridge into the empty slot the direction in which the empty cartridge was removed. Push down until you hear and feel the cartridge click into place. Close the scanner portion of your printer and select the Start button. It will take approximately 90 seconds for your print head to adjust and move to its home position. Once you see a confirmation message on the LCD screen, you're all set! Visit Epson XP-430 download page to find Espon XP-430 updates and useful downloads such as Epson XP-430 driver downloads, Epson XP-430 firmware download, Epson XP-430 firmware downgrade, Epson XP-430 manual, & even a Epson Expression Home XP-430 review. Experiencing issues with your Epson XP-430 printer? Epson XP-430 black ink not printing or Epson XP-430 printing blank pages? Check out this below for some useful information about your Epson XP-430 printer! Why does my Epson printer print blank pages? Why does my Epson printer not print properly? Verify in your printing program and software that you have chosen the correct paper size setting. Check to see if any of the nozzles are clogged by running a print head nozzle check. Clean the printer head after if needed. Check your printer cartridges to see that the yellow tape has been removed. Windows 10: Right-click on Windows Start icon & select Control Panel > Hardware and Sound > Devices and Printers. Right-click the product name & select Printer Preferences. Windows 8.x: Go to the Apps screen & select Control Panel > Hardware and Sound > Devices and Printers. Right-click your printer & select Printing Preferences. Windows 7: Click on Windows Start icon & select Devices and Printers. Right-click your printer & select Printing Preferences. Windows Vista: Click on Windows Start icon & select Control Panel. Select Printer which is found under Hardware and Sound or Printers. Right-click your printer & select Printing Preferences. Windows XP: Click Start & select Control Panel or point to Settings & select Control Panel. Select Printers and Other Hardware (if available). Then Printers and Faxes. 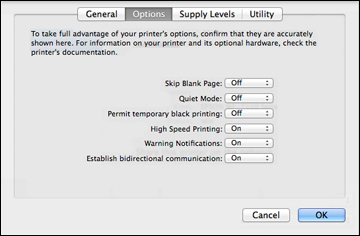 Right-click your printer & select Printing Preferences. Step 2: Select the Maintenance tab and click the Extended Settings button. Step 3: Located in the Settings area, select the Skip Blank Page setting or checkbox. Step 4: Select OK to save your settings. Select one of the following: Print & Scan, Print & Fax, or Printers & Scanners. Select your printer, then Options & Supplies. Set the Skip Blank Page to On. Why is my Epson printer not printing when the ink is full? Check your LCD screen for a message stating that your cartridges are expended. Remember which ink cartridge needs to be replaced and press the OK button followed by the option Replace now. Squeeze the tab on the cartridge releasing it from its slot. Lift to remove the empty ink cartridge. Check to see if the the yellow tape located on the side of the cartridge is removed. If is still there, remove it. Insert the replacement ink cartridge into the empty slot the direction in which the cartridge was removed. Push down until you hear and feel the cartridge click into place. How do you reset your Epson printer? Are you experiencing issues with your printer settings? If so, you have the option to reset your printer to its default factory settings. You have the choice of choosing which particular settings to reset or reset them all. Press on the home button, if needed. Using the left or right arrow button, choose the Setup option and press the OK button. Using the left or right arrow button, choose the Restore Default Settings option and press the OK button. Network Settings: Resets all network settings. All except Network Settings: Resets all control panel settings, except for network settings. All Settings: Resets all control panel settings. You should see a confirmation screen. Press on the OK button to reset your selected settings. For more troubleshooting tips, visit this Epson XP-430 Support Page.